Brunch AND Dessert?! Say It Isn’t So… – Damn, I Can Make That! ← And So the Damn Blog Begins! Shout out to Pinterest, where I stole the idea for this from. Not bragging, but I kicked it up a notch or two by making it more flavorful so I am here to share my quickest dessert yet. Oh, and PS, not ONLY is it dessert friendly, but I have most definitely served this for brunch with coffee and a side of bacon or eggs or something else savory. So essentially this is a brunch and dessert recipe that takes literally NO culinary skills at all. And did I mention it takes 4-5 ingredients? So no long grocery list on this one. You literally can recite it! 1 box of blueberries (measuring wise say about 1/2 cup since you won’t use the whole box. Also don’t get crafty and use strawberries, I may or may not have done so and ended up ruining this recipe. Apparently strawberries have too much water content and they turned this recipe into mush! I mean it looked like I vomited on the pan, mush. Maybe raspberries would work, but just follow directions. Don’t be a maverick and just do the blueberries). 1 lemon (Zest only needed, zest means grate peel, not talking down to ya just sayin’). 1 8 oz. package of cream cheese (you can do the block, tub or whipped kind not sure it makes any kind of difference). 3tbsp of Brown sugar or regular sugar (I prefer the brown because of the molasses-like flavor, but regular is totally fine). Pinch of cinnamon to taste (leave out or add an extra pinch based on what makes your toes curl). Take a bowl add the cream cheese, the zest of half of the lemon (2tsp or so), 3 tablespoons of the sugar, and that pinch or 2 of cinnamon and mix. Unroll dough into four rectangles, fat ends to each other, skinny ends out. (Think star shape) Firmly press perforations together to seal. (See picture because I am describing this terribly). Smooth cream cheese mixture on to center of the star (within 1/2 inch of edges) and top w the blue berries, then bring opposite corners of rectangles together; press together to seal. Place on ungreased baking sheet. Bake at 375 degrees for 11 to 13 minutes and you have a dessert, brunch side, or coffee snack that is home made, that is delish and took only 15 damn minutes. 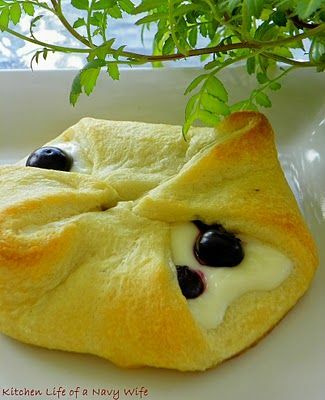 This entry was posted in Eggscetera, Sweet Tooth and tagged Blueberry, Brunch, Cream cheese, Dessert, Recipe, Zest (ingredient). Bookmark the permalink.